When I heard the loud sweet song of the first Baltimore oriole of the year, I dumped out the peanuts from the oriole's own feeder (where the titmouse fed all winter) and filled it with grape jelly. 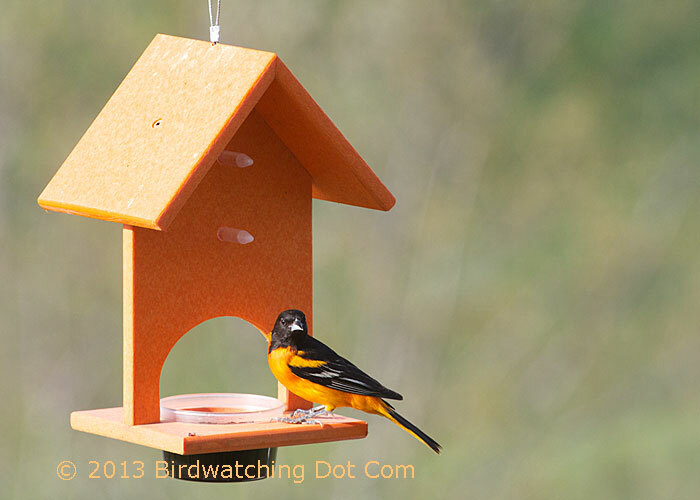 The next day, the feeder was getting steady business from the orioles. Today is cold again, and the orioles are coming for that jelly like mad. Tempt orioles in close with their own feeder, and stock it with grape jelly. We had tried grape jelly before without much success. Then we got the Oriole Grape Jelly Cafe and filled the red cup with Birdberry Jelly, and we had orioles the same day!